As you know I was delighted to be asked to help with judging for the 2014 FreeFrom Food Awards (click here to read about my day). A day off work to eat food, who can resist that offer. Whilst it had its ups (discovering Bessant & Drury coconut yoghurts) and downs (lack of egg free biscuits), I give a high five to all the winners and runners up because without you, both my sister and I would struggle with our restricted diets. The growth of the Free From market has changed enormously in my lifetime. It's the simple things that matter, I now buy dairy free cheese and Easter eggs and to me that's amazing! Sadly, I had to miss out on the Awards Ceremony but I was watching all the excited tweets on Tuesday evening. If you would like to view the complete list of winners and runners up click here. I still think that in recent years, gluten free is the driving force behind many free from products. I would like to see a growth in foods that cater for multiple allergies. I know that is not an easy task but I do find it sad that recently I feel I must turned my back on the free from shelves because I can not seem to find egg free products. The food I eat is marketed at Vegans and often not found in the free from section at the supermarket. I wanted to pick out some of my personal favourites from the award categories. Nairn’s Gluten free biscuit breaks (oats & fruit) were the winners. I already buy this product on a regular basis. Pat on the back for being gluten, dairy, egg, soya and nut free (manufactured on a line that handles milk). Bessant & Drury Morello Cherry & Madagascan Vanilla coconut yoghurt was highly commended in the Breakfast category. Finally, after spending years watching my boyfriend devour Muller Fruit Corners, I will be able to buy a dairy free alternative. This product was the highlight of my day of judging and now I just need them to stock in my local supermarket. Amy’s Kitchen Thai Red curry was highly commended. This one is a personal favourite and currently the only Vegan ready meal option I have available at my local supermarket. The winner in this section was Georgia’s Choice Gluten Free Mexican bean bake (suitable for vegans), a brand I had not heard of before now. I'm very intrigued by the Vegusto ‘Cheese’ sauce, that would certainly make a convenient option for dishes like lasagne or macaroni cheese. Smooze Mango fruit ice were highly commended. I discovered these last year and I'm such a big kid because I buy these. I personally like the plain coconut version but mango ones are nice too. Moo Free Minty Moo are amazing and I wish more stores stocked them. Nice to see my favourite Pudology Banoffee pud as a joint winner in this category with Bessant & Drury Raspberry swirl frozen coconut yoghurt. Can I get an Hallelujah for a dairy free frozen yoghurt? I NEED to buy this ASAP!! The big winner was Focaccia Per Tutti Focaccia Mediterranea, not that I had ever heard of them! The Focaccia ticks several free from boxes being gluten, wheat, dairy and soya free. I have been browsing the website (which could do with improving) and I don't see eggs in the ingredients but it's not promoted as egg free? I did smile to myself whilst writing this blog post because I realised I didn't need stock photos for a picture, these products were already in my cupboard. Next time you are at the shops, look out for the yellow award stickers, I am sure they will be cropping up on the winning products. 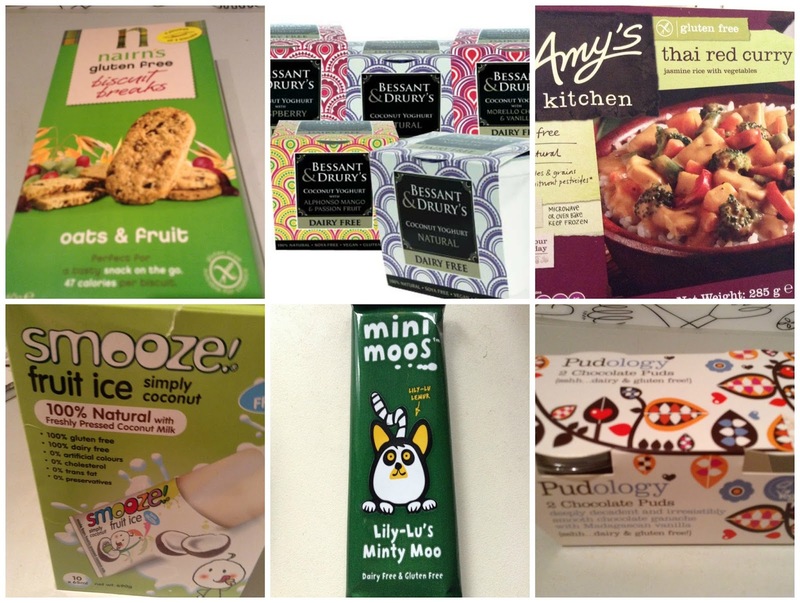 What do you think of the FreeFrom Food Awards? Were any of your favourite products on the winners list? Were there brands that you had not heard of? Nice reviews! I love Amy's but for some reason always avoided the Thai Red Curry - no idea why! I think I will try it out now.